VANCOUVER, BRITISH COLUMBIA--(Marketwired - July 22, 2014) - Skyharbour Resources Ltd. (TSX VENTURE:SYH)(FRANKFURT:SC1N)(OTC Grey:SYHBF) (the "Company") is pleased to report inaugural drill assay results from the Preston Uranium Property (the "Property") being explored by the Western Athabasca Syndicate (the "Syndicate"). Three out of fifteen existing targets received preliminary drill testing this spring, including the Swoosh (7 holes), CHA (1 hole) and FSA (1 hole) targets. The drilling totaled 1902.7 meters over 9 holes. Drill targets were chosen based on results from a combination of airborne geophysical, geochemical and geological surveys carried out during 2013 and 2014, which were then further refined by ground HLEM and gravity geophysical surveys. 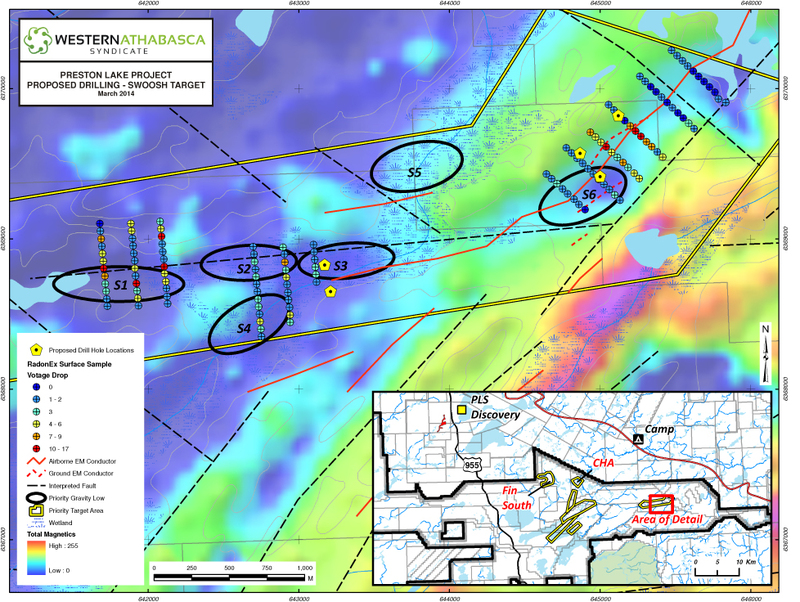 The results from the drilling are very encouraging and confirm the presence of widespread alteration, structural disruption and radioactivity that are typically associated with uranium deposits in the Athabasca Basin. As well as additional testing of the areas targeted with the 2014 first-pass drilling, the Syndicate is also planning further work to better define drill targets at the other twelve target areas defined by fieldwork to date. The majority of uranium targets on the Property have not yet received any drill exploration. Seven widely-spaced drill holes tested two targets (S3 and S6) within the broader Swoosh area, a 6-km long corridor defined by coincident gravity, magnetic and EM geophysical surveys, and surficial geochemical anomalies. Six holes were completed to depths of between 200 and 360 meters downhole, with one hole abandoned due to poor drilling conditions. Overburden depth varies from 4 to 38 meters and immediately overlies basement rock. The five holes completed on the S6 target tested two distinct steep NW-dipping conductor traces associated with a 650 meter by 350 meter gravity low anomaly. Every hole encountered graphite within highly deformed metasediment, orthogneiss and locally pegmatitic lithologies. Portable Infrared Mineral Analyser (PIMA) results confirmed the presence of extensive chlorite and clay alteration, as well as significant illite alteration in the northernmost hole PN14001. This alteration and deformation explains the gravity anomaly at S6 and further confirms the Swoosh area as being the locus of intense hydrothermal alteration which is common to other Athabasca Basin uranium deposits. The best intercept out of 125 drill core samples collected from holes testing the Swoosh area was from PN14003 which returned 0.5 meters of 8.82 ppm U and 360 ppm Th associated with mixed granodiorite and graphitic mylonite. Analyses of the U to Th ratios, in light of the strong deformational history, suggests that the S6 target has been subject to high degrees of uranium depletion and may have at one time hosted significant uranium mineralization which could have been re-deposited nearby. The CHA area is located approximately 19 km west of the Swoosh area. A single initial hole, PN14008, drill tested an EM conductor near the hinge of a major fold structure in an area of elevated uranium and radon geochemical anomalies. This hole intersected gneiss and orthogneiss within broad zones of cataclastic deformation. Fault gouge associated with disseminated graphite and strong chlorite, epidote, talc and clay alteration may explain the airborne and HLEM conductors at this zone. Like Swoosh, radioactivity from the first CHA hole is thorium-rich, with the best intercept returning 4.25 ppm U and 62 ppm Th over 1.0 meter. At the FSA area, located approximately 27 kilometers west of the Swoosh, a single drill hole, PN14009, tested an E-NE trending magnetic low coincident with airborne EM and ground based HLEM conductors that are in part associated with pronounced gravity anomalies. In addition to the geophysical anomalies, this target has outcrop nearby that exhibits structural deformation and returned anomalous uranium values from rock grab samples including one sample that returned 45.7 ppm U. The single drill hole was collared in granodiorite gneiss and then intersected mylonitic pelitic gneiss coincident with intense shearing and chlorite, hematite, silica and clay alteration. The hole was abandoned at 150.3 meters after intersecting a bluish-grey clay-rich lithology at the contact between the overlying orthogneiss and metasediments. The best intercept out of 16 samples returned 5.84 ppm U and 19.5 ppm Th over 1.0 meter. The clay-rich unit returned highly anomalous silver values and a relatively high radiometrically-sourced Pb isotopic signature that warrants further follow up drilling. 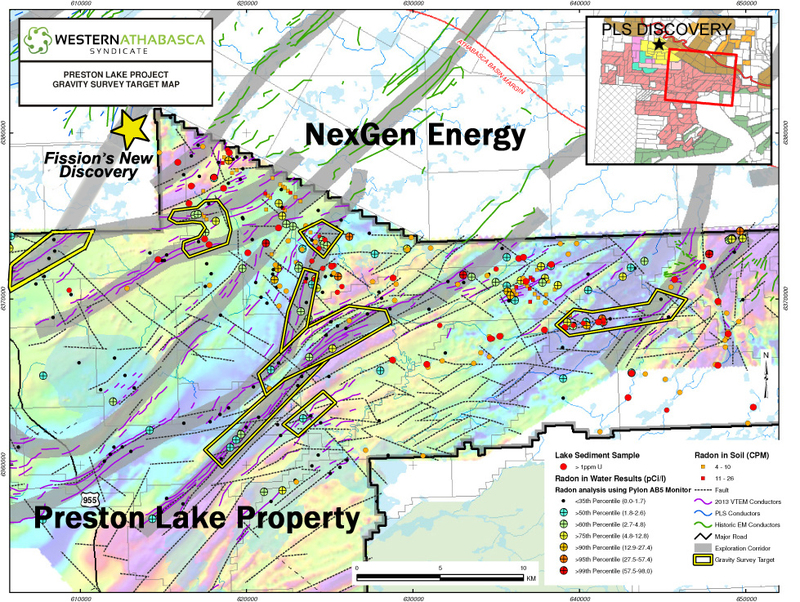 The 246,643 hectare Preston Uranium Property is the largest individual property proximal to Fission Uranium Corp.'s Patterson Lake South ("PLS") high-grade uranium discovery and the recent discovery made by NexGen Energy Ltd. on the Rook-1 Project. The Syndicate is the largest land tenure holder in the southwest Athabasca Basin region including properties strategically situated to the southwest and to the northeast of the PLS and NexGen discoveries. Approx. $3,500,000 dollars in exploration has been carried out to date by the Syndicate on the Preston property and many priority targets remain for further follow up with both fieldwork and drill testing. Management cautions, mineralization present on proximal properties is not necessarily indicative of mineralization on the Syndicate's Property. The Athabasca Basin of Saskatchewan hosts the world's largest and richest high-grade uranium deposits which have grades substantially higher than the world average grade of about 0.1% U3O8. The Patterson Lake area has received escalating exploration attention and claim acquisition activity as a result of the new, near surface discoveries made by Fission which includes the recently reported drill interval of 38.49% U3O8 over 10.5 metres in drill hole PLS14-129. Consistent high-grade, near surface U3O8 assays from Fission demonstrate the potential for high-grade uranium mineralization on the geologically prospective yet underexplored margins of the western side of the Athabasca Basin. Skyharbour Resources Ltd. is a uranium exploration company and a member of the Western Athabasca Syndicate which controls a large, geologically prospective land package consisting of five properties (287,130 hectares or 709,513 acres) in the Athabasca Basin of Saskatchewan. $6,000,000 in combined exploration expenditures over the next two years is planned on these properties, $5,000,000 of which is being funded by the three partner companies. Skyharbour also owns a 100% interest in the Way Lake Uranium project on the east side of the Basin which hosts an NI 43-101 compliant inferred resource totaling 7.0 million pounds of U3O8 at 0.03% and 5.3 million pounds of ThO2 at 0.023%. 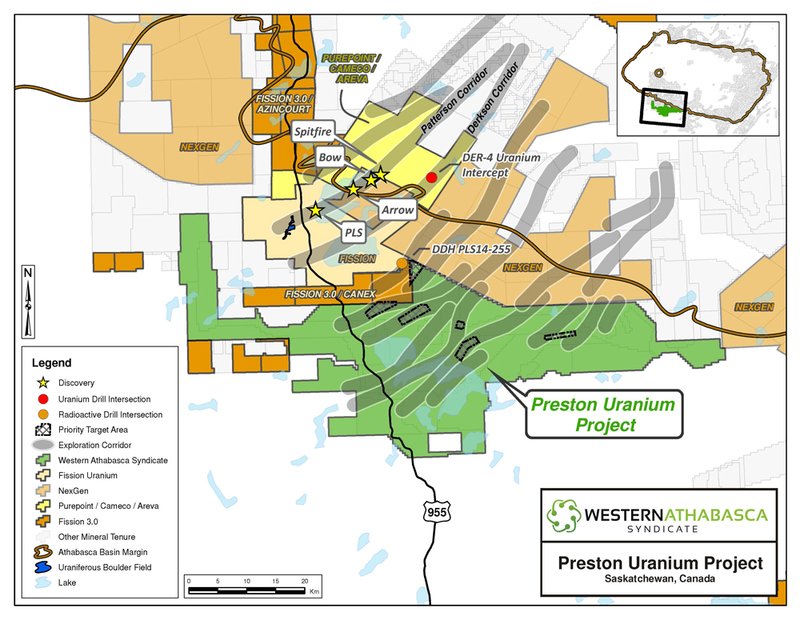 Skyharbour owns a 60% interest in the Mann Lake Uranium project on the east side of the Basin strategically located 25 km southwest of Cameco's McArthur River Mine. The Company has 57 million shares outstanding with insiders owning over 20% of the outstanding shares. Skyharbour's goal is to maximize shareholder value through new mineral discoveries, committed long-term partnerships, and the advancement of exploration projects in geopolitically favourable jurisdictions.